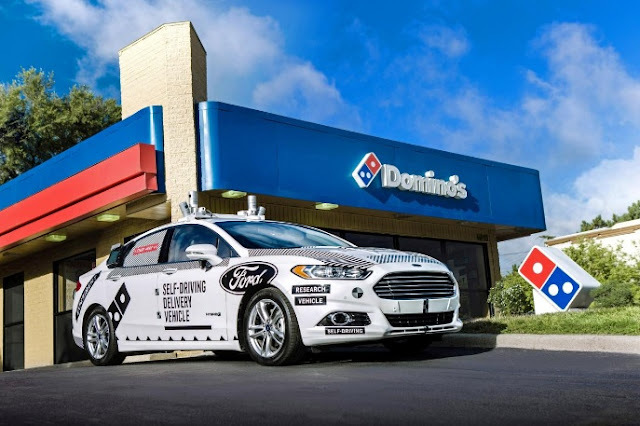 ANN ARBOR, Mich. - Ford Motor Co and Domino’s Pizza Inc in September will begin testing Michigan consumers’ reactions to having their pies delivered by self-driving vehicles, the companies said on Tuesday. It will not be the first experiment with advanced pizza delivery technology. Australia-based Domino’s Pizza Enterprises, the Ann Arbor-based company’s largest independent franchisee, has tested delivery to customers in New Zealand via drone and self-driving robot. Previously, Ford executives had said the company expected to launch a self-driving shuttle for commercial ride-sharing fleets in 2021. A number of start-up delivery services, many of them funded by venture capital, have been experimenting with on-demand delivery of different packages, including groceries, prepared food and beverages. So have larger companies, from Uber Technologies [UBER.UL] to Amazon. Opinion is still divided, however, on whether automation can help solve some vexing delivery problems, such as how to deliver pizzas economically to the fifth floor of a college dorm. The Ford-Domino's test vehicle will not attempt to resolve that conundrum. It will stop outside the customer's house, so it will not provide true door-to-door delivery service. "We're still focused on the last 50 feet," said Domino's spokeswoman Jenny Fouracre. "That's a big challenge - getting (the pizza) from the curb to the door."